Our Fundraising goal is $5,250. This number represents the number of women in May in the U.S. who will experience extreme pregnancy-related complications requiring medical interventions. COHI makes our impact through local, women-led community partners. We follow their lead in procurement of supplies and these partners are the ones to distribute the supplies to their communities since they are closest to those who are the most in need. What does $5,250 do? $60 provides a month of prenatal vitamins which can reduce maternal anemia. depletion of a previous pregnancy before becoming pregnant again. in this community will make a difference in addressing this. COHI aims to support these local partners through our provision of professional and clinical volunteers, medical and community capacity training, the procurement of requested and appropriate supplies and equipment, and by raising funds for the organizations to provide the services that women and children require. 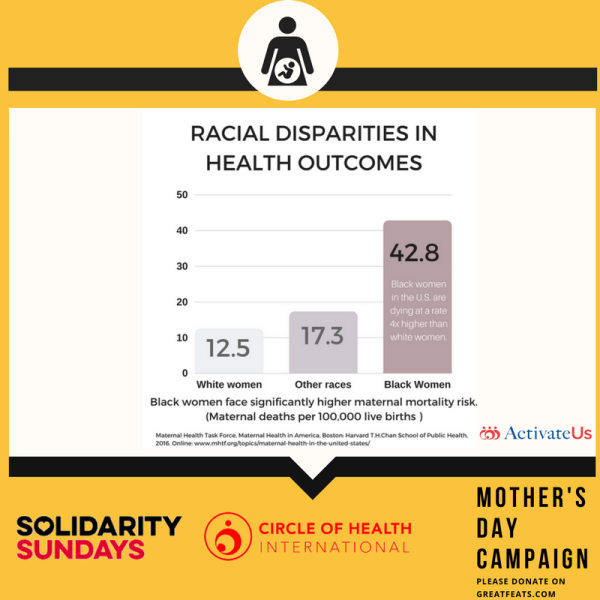 This May, in honor of Mother's Day, Solidarity Sundays is proud to partner again with Circle of Health International (COHI) to raise money to address the disparities in maternal health in the U.S. for women of color. COHI is run by an Austin SolSun host, Sera Bonds. Sera and Solidarity Sundays worked together to raise money last fall after the Northern California fires, and raised over $3000 for the Undocufund, which provided support to undocumented families affected by the fires. Every year in the U.S., nearly 900 women die from pregnancy or childbirth-related causes. The divergent trends of mothers surviving pregnancy and labor highlight the disproportionate perinatal racial and ethnic disparities in this country. The American medical system has failed to adequately address maternal mortality that disproportionately affects black women. Black mothers in the U.S. die at 3x the rate of white mothers, one of the widest of all racial disparities in women's health. Put another way, a black woman is 22% more likely to die from heart disease than a white woman, 71% more likely to perish from cervical cancer, and 243% more likely to die from pregnancy- or childbirth-related causes. Women of color have long experienced stark health disparities in pregnancy related complications. The root causes stem from a dark history of institutional violence, racism, and discrimination. This includes the lack of access to high-quality, affordable health insurance and care and, for some, a lingering mistrust of the medical community based on decades of mistreatment. Let's see what the Solidarity Sundays community can do for mamas of color in the U.S. this May!